Yesterday afternoon when I opened Facebook and saw the news that Notre Dame Cathedral in Paris was on fire, my heart sank. I hoped it was a minor fire and the pompiers (firefighters) in Paris would be able to put it out. But as the afternoon wore on and my social media feeds filled with pictures and videos of the raging fire, that sick feeling in my stomach grew. 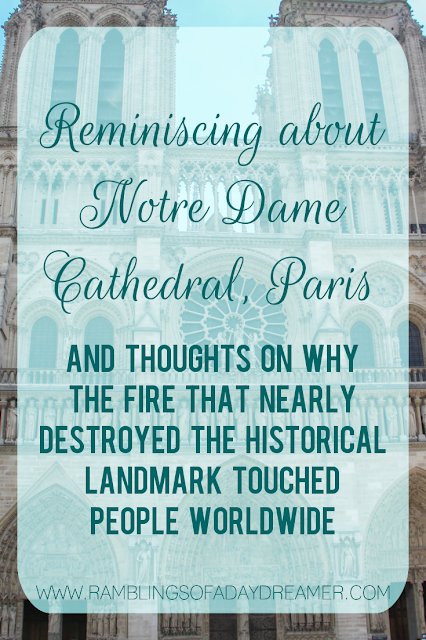 Notre Dame was burning in earnest; 800+ years of history was literally going up in flames. Now because there are always ignorant, negative people on social media, I had the displeasure of seeing someone make the comment, “But it’s only a building. Be glad nobody died.” Of course everyone is glad nobody died; it’s an absolute miracle nobody was killed. And, yes, okay, it is technically just a building and you can’t equate that with the loss of human life. But it’s so much more than ‘just a building’. For centuries, Notre Dame has been a symbol of Paris. A symbol of art, architecture, history, religion, and culture. It has survived the French Revolution and two World Wars. 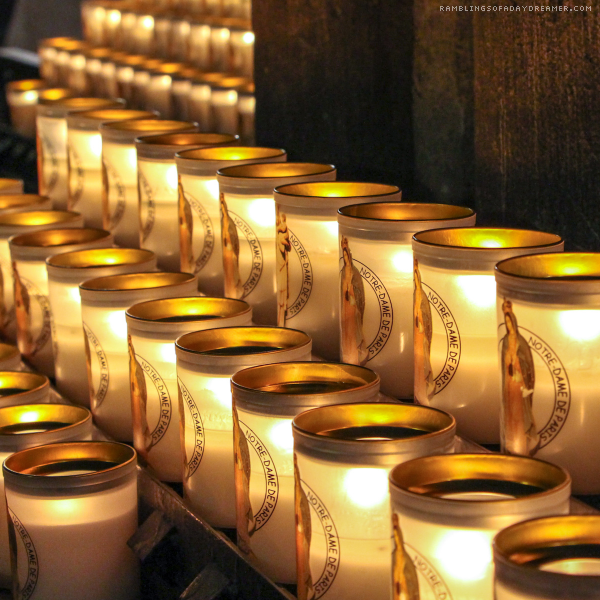 You don’t have to be Catholic - or even Christian - to appreciate its beauty and rich history. Those things, paired with the fact it seemed like one of those monuments that would be around forever, are part of what makes this such a devastating tragedy for people all over the world. Whether you’ve been to Notre Dame, hoped to go there someday, or you’re indifferent, this is a loss felt by the whole world. 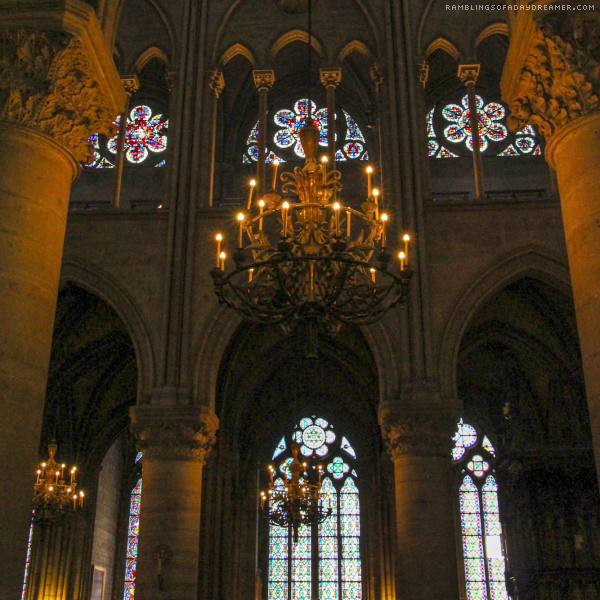 I had the pleasure of visiting Notre Dame twice. My first time was in 2001; I was 17, and it was my first trip abroad. It was a whirlwind ten days of history and art and food and freedom. 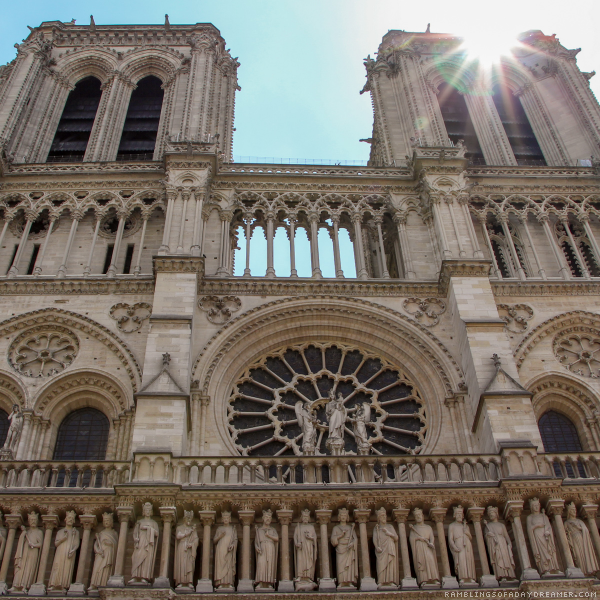 We saw ancient buildings and priceless art and so many things that left me speechless, but I remember being in complete awe when we walked into Notre Dame. It was swarming with people, and yet there was this hushed sort of reverence inside as people wandered around or sat in the pews or lit candles. I vividly remember stopping in front of the statue of Joan of Arc and feeling this rush of emotions that brought tears to my eyes. I had just done a school project on the saint and felt this strange affinity to her; I had gone above and beyond on my project, reading everything I could get my hands on (and these were the days when there wasn’t much to be found online, so I think I checked out nearly every book from my library that so much as referenced her). Even though it was just a statue, it was like history coming alive in front of me and making it more real. Another special moment was when I lit a candle in memory of my dad, who died in 1994, and whose family originated in France. My second trip to Paris, and to Notre Dame, was in 2015. Our time in Paris was cut short after an issue at the border in Callais, France (it was closed due to riots and strikes, so we were stuck in Dover, England for a day, unable to cross the Channel until the border reopened). That meant we only had about two full days in Paris, but we were determined to make the most of it and see as much as possible. I knew for sure that despite having seen it 14 years before, I wanted to see Notre Dame again. It had made a real impression on me, and I wanted my travelling companion/bestie, Krista - a fellow lover of art, history, and architecture - to see it. I can honestly say it was just as awe-inspiring the second time. Tragedies like this show us that nothing - not even the things that seem indestructible and eternal - lasts forever. Just because something has stood the test of time, as Notre Dame did for hundreds of years, doesn’t mean it can or will forever. A friend messaged me yesterday and told me how much she regretted skipping a visit to the cathedral during both her visits to Paris because of the long lines, assuming she’d visit it next time. I saw other people sharing the same sentiment on social media yesterday and this morning. Because that's the thing, right? We all think we have time. Time to see and do the things we want, especially when it comes to seeing the things that have always been there and you assume always will be. When I think of my last trip to Europe, one thing that often comes to mind is the number of times we had to wait in line. The first instance was our visit to the Tower of London. Krista and I wanted to see the Crown Jewels, but the people we were with didn’t want to ‘waste time’ in line. Krista and I looked at each other and agreed that we hadn’t travelled thousands of miles to let something like a line stop us from seeing something we wanted - and had paid a lot of money - to see. So we got ourselves some ice cream from a nearby vendor and we waited in line, taking pictures, talking, and laughing all the while. That moment set a precedence for us: if there was something we wanted to see, screw the lines. 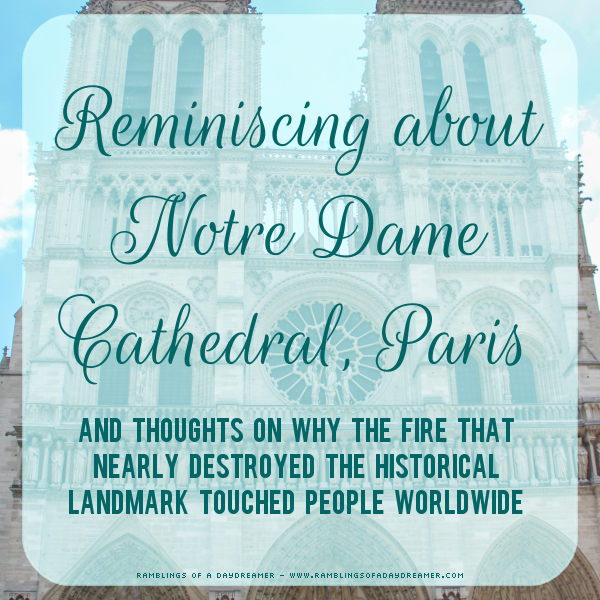 It happened again several times throughout our travels (the most memorable being the hour we spent in the blazing Italian sun while waiting to enter St. Peter’s Basilica in the Vatican), including when we visited Notre Dame. We had a limited amount of time to squeeze in everything we wanted to do, but it was a beautiful day, so even though the lines stretched all the way to the end of the square, we joined the queue. Now I’m so grateful we did. We hear about ‘gentle reminders’ all the time these days. ‘Just sending a gentle reminder to get your entries in for X by tonight’ or a ‘gentle reminder to practise self-care’. Well, let this horrible event serve as a not-so-gentle reminder. Do the things you want to do. See the things you want to see. I know it’s not always that simple, believe me. If I could hop on a plane to Europe right now I would, but it’s not possible right this moment. But whenever possible, even if it may make you a little uncomfortable, even if it means stepping outside your comfort zone (hell, especially if it means stepping outside your comfort zone), even if it takes time, even if it means waiting in a huge line, do the things you want to do. Don’t assume you can ‘do it next time’ because there might not be a next time. Let this also serve as an everyday reminder: Take chances. Do the things you love to do, as often and as joyfully as you can. Appreciate the good people in your life. Make sure the people you love know how you feel about them. See and do as much as you can, because tomorrow isn’t guaranteed. It was crazy watching the coverage of the fire. I was a bit sad because I hope to one day go to Paris and probably by the time I do it will be rebuilt, but it won't quite be the same. It'll be like visiting New Orleans. There's before the disaster and after.